What's Your ySNP Testing Strategy? Tested 67 ySTR Markers? Now What? At the beginning of the 20th century, on June 4, 1900 to be more precise, the census taker who came calling along the 600 block of Wrightwood Avenue in the Lake View neighborhood on the near north side of Chicago was enumerating a lot of families where the parents claimed Germany as their place of birth and their children claimed Illinois. He found the residents of 673 Wrightwood to vary only slightly from this pattern. 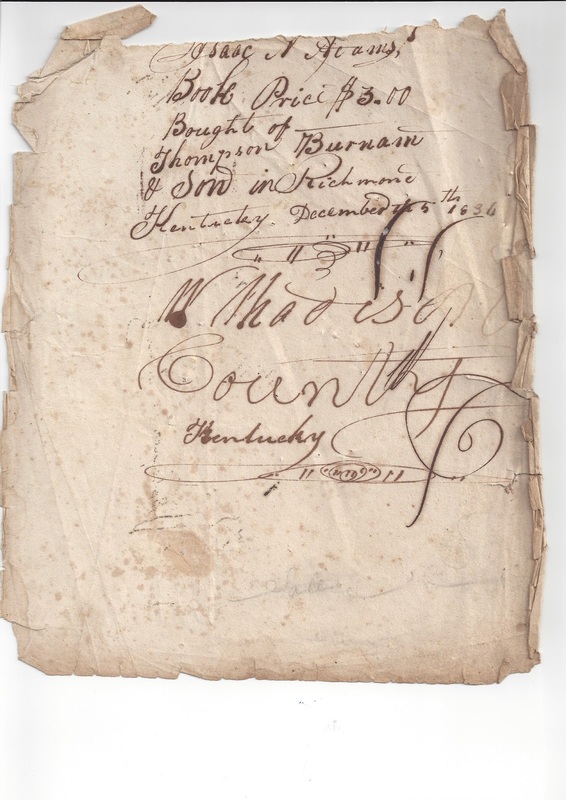 Only one of the parents of the four households at that address claimed to be native born. All twenty of the children claimed to be native born although one claimed Wisconsin as his place of birth. The others claimed Illinois. At least that is what the census taker appears to have been told, but are things always as they appear on the surface? At least three of the four families at 673 Wrightwood Avenue were interrelated. Our primary interest is with the family of Christoff and Cecilia Paepke. Also living at this address were Cecilia's sister, Francisca, who was married to Gustav Ewald; and Gustav's brother, Paul Ewald, who was married to Sophia. Our interest focused on this Paepke household because of the presence of my wife's maternal grandfather, Felix, who had then just turned 13 the previous week. 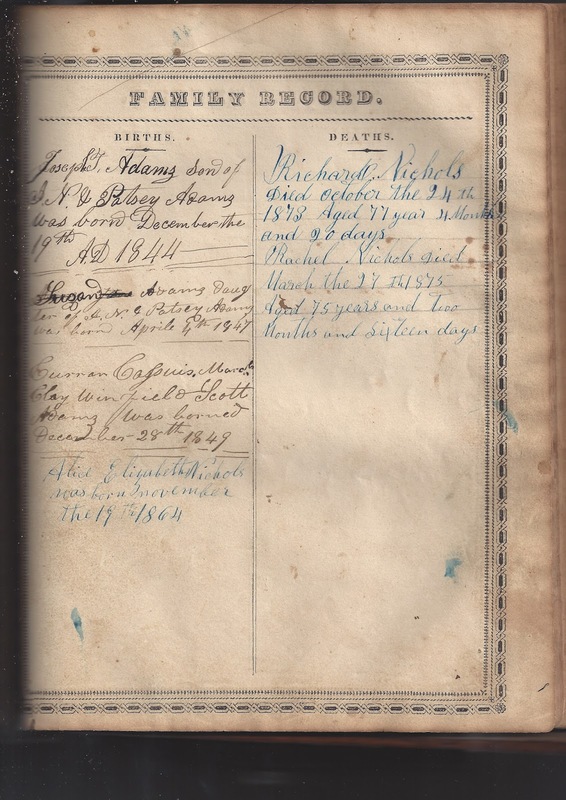 This census record is the earliest civil record in which we have found him. He had previously appeared in a christening record at St Alphonsus Church in June, 1887, when he was two weeks old. But first lets explore his older brother Frank who was listed incorrectly as being 16 with a January, 1884 birthday--probably an honest mistake of exactly one year. Paper is a very neutral medium. It will record any nonsense any fool writes down. The first question to arise concerns the birth location and biological father of Felix's older brother Frank. 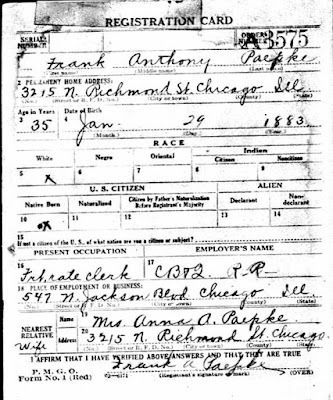 All records civil and church located in Illinois have consistently listed Frank as a native born American. 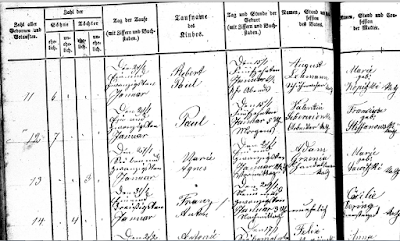 Frank may not have known this was not correct, but he was not born in the U.S. A christening record for him has been located in church records in Neustadt, Westpreussen. There were many Neustadts in Germany/Prussia of the 1880s. This one is located in what is now northwest Poland -- not too far from the city of Danzig/Gdansk. From 1815-1919 this was part of the Kingdom of Prussia. 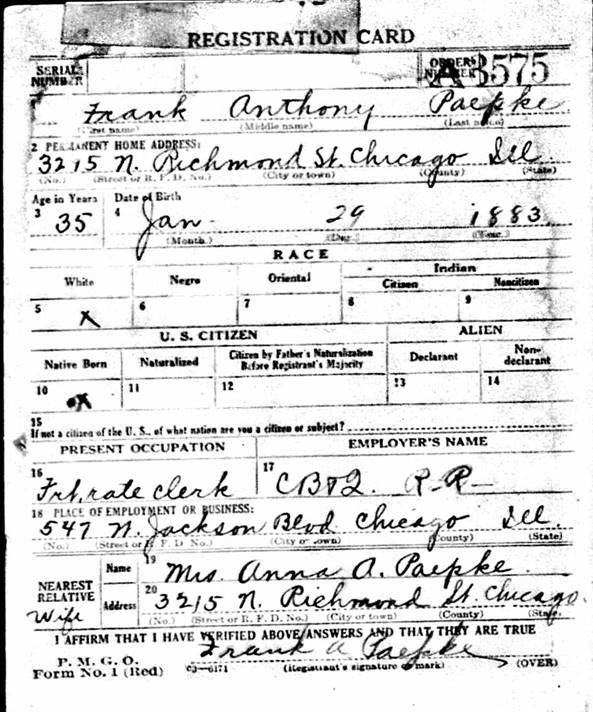 His date of birth listed in his christening record is consistent with the date of birth used later in life in Chicago. However, the place of birth was on the opposite side of the Atlantic. "Cecilie Dering" is listed as the mother but the father is unknown. The following year Franz got to the western shore of that ocean along with his 24 year old mother "Cacilie". 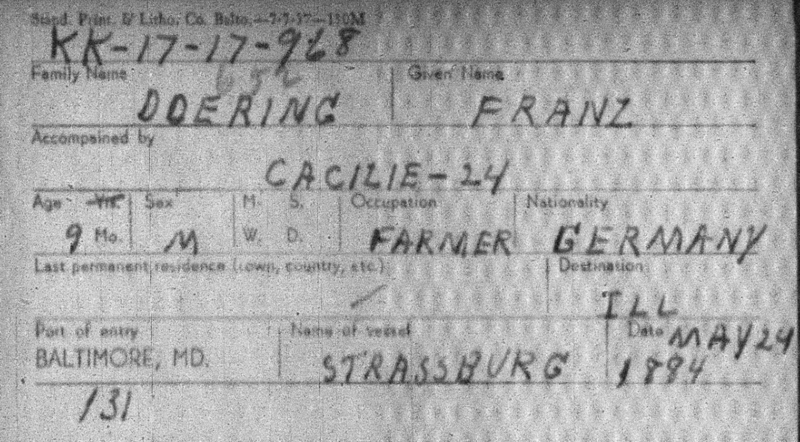 Franz was actually about 16 months old by then but still a little young to already be a farmer as listed on his index card. The two of them made it to their listed destination of Illinois. Was that because Cecilia already had family there? Her sister immigrated the previous year with the stated intention of going to Michigan. 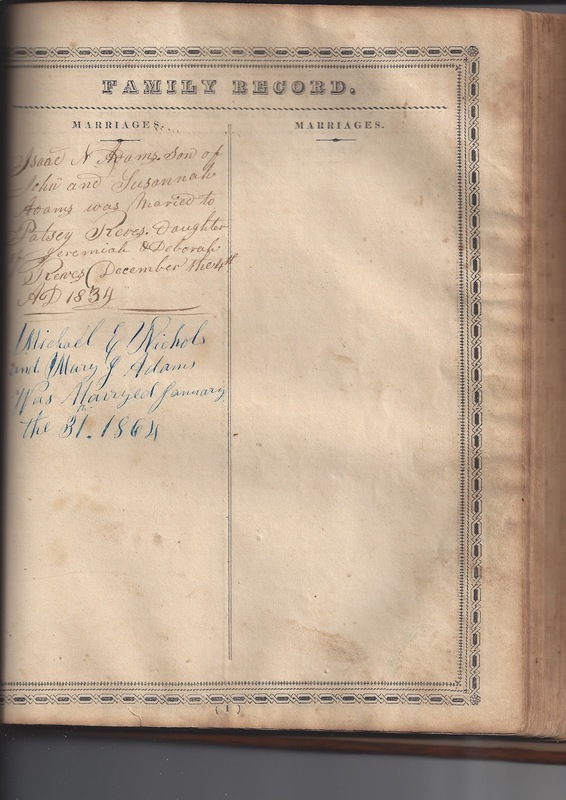 Perhaps Francisca was already in Chicago where she was married on May 4, 1885. Perhaps there was some other draw. No evidence has emerged to support the thesis that Cecilia was going there to meet the father of Franz Anton. 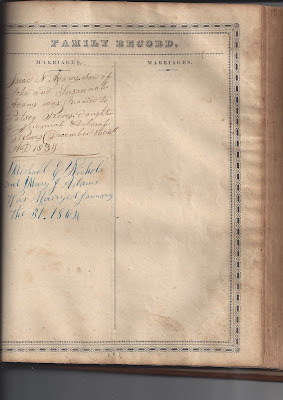 The man Cecilia subsequently married on January 15, 1887, Christoff Paepke, was still in Germany until late August, 1885, when he sailed from Hamburg to New York. 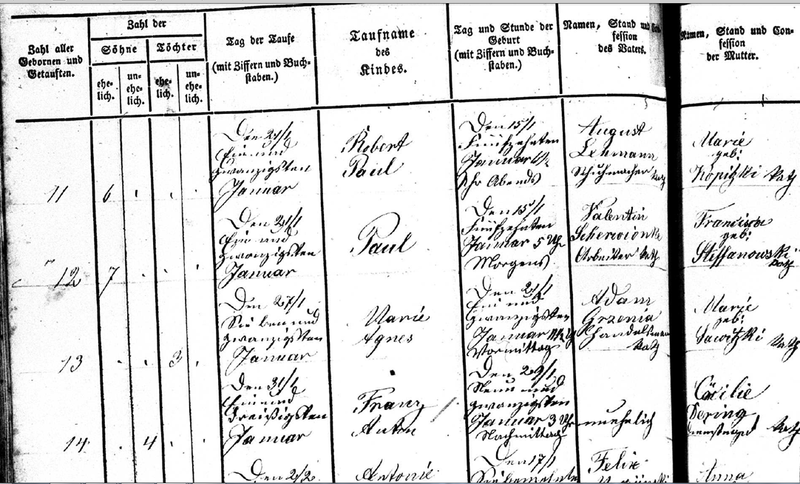 Based on multiple reports Paepke was from Mecklenburg -- more than five hundred kilometers from Franz Anton's birthplace. 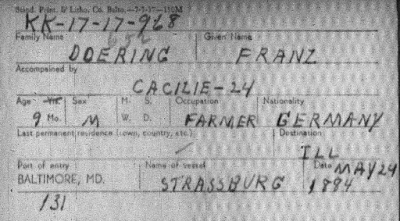 Franz's biological father remains unknown. In my last post Tested 67 ySTR Markers? Now What?, I discussed how you could get some idea of what your more recent ySNPs might be than the ones estimated by FTDNA. This knowledge can be useful whether or not you want to pursue further SNP chasing aggressively or not. 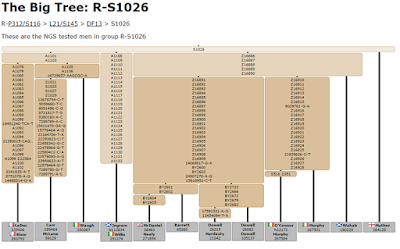 To build on the example in that last post, it looks like most if not all of those who had ySTR matches in that group actually belong to the R-S1026 haplogroup. This is a small clan that is now thought to have split from DF13 about 3,500 years ago. 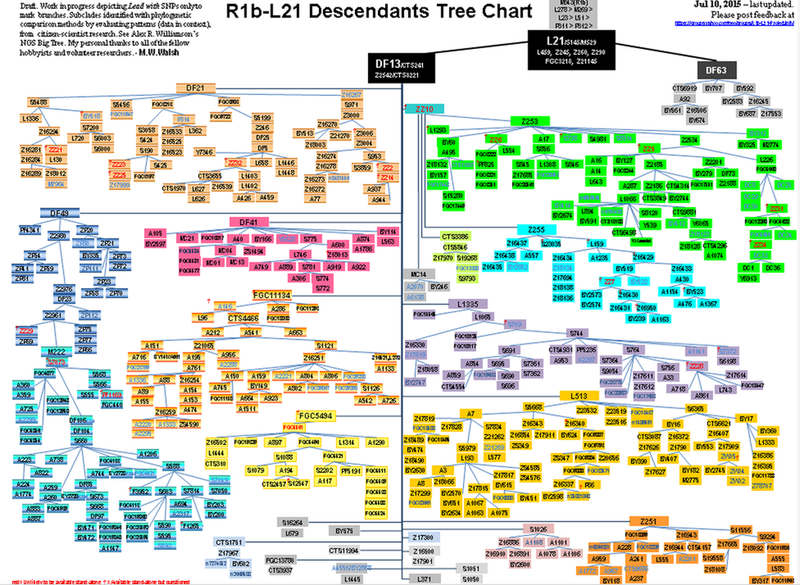 S1026 was just added to the FTDNA SNP Tree about a month ago. 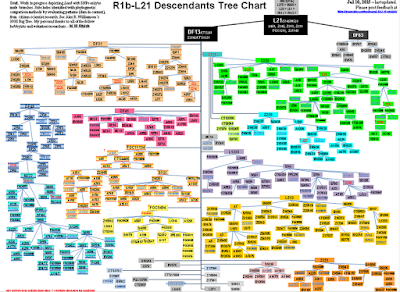 It still has not been added to the ISOGG yTree although the L21-DF13-S1026: R-S1026 and Subclades Project is linked from there. Our mechanisms for organizing new findings have been overwhelmed by the SNP tsunami of the last two years. Only a small fraction of these SNPs were known two years ago. We are still in the early days of understanding SNPs. We are about where we were about 10 years ago in our understanding of STRs. Now I must introduce the concept of a block of SNPs. In Alex's chart above most of the SNPs between S1026 at the top and the individuals tested at the bottom are located in blocks (or boxes). These blocks may contain only a couple of SNPs or as many as 30. We know that these SNPs in a given box are located contiguously but we are still working to determine their exact sequence chronologically. In addition it is thought that these SNP mutations occur at random but about once ever 150 years. That number will be refined as more individuals are tested and our knowledge base grows. In the chart above some of the men listed at the bottom would be the ones that are likely to have been your 67 marker STR matches in my previous post. In this case they are the ones under the large fat SNP block in the center of the chart. Your results will differ. This example is a little skewed because several of us encouraged our closest ySTR matches to take the BIG Y test -- a strategy you may wish to employ if you do decide to take the BIG Y test. If you are fortunate enough to be chasing a SNP that is below R-L21, you will be able to use the tools created by Mike and Alex to learn more about your own SNP path. If you are a member of a different haplogroup, hopefully there will be an experienced SNP chaser in your group who can guide your search. These volunteers are absolutely the most knowledgeable individuals about your haplogroup. I am going to continue to use my own haplogroup for illustration purposes. Of course your situation will differ. Within our haplogroup project we have proved that those with close ySTR matches also appear to have relatively close (pun intended) ySNP paths of descent down through the eons. The three strategies from which you can choose going forward depend on your genealogical goals and the amount of disposable cash you can use to feed this addiction. This is clearly not the case where one strategy is the best fit for all. to test with one of the bundled panels that are being assembled by various labs. Of course you can choose a 4th option -- none of the below. That would be to travel through ySNP-land vicariously as we have been doing in this post and the post that preceded it. However, if you wish to further explore your own situation, I would encourage you to chose ONE of the strategies below and not to flip-flop back and forth between them. The strategy that appears to be the least expensive at the beginning can become the most expensive over the long term. Both FTDNA and YSEQ offer single SNP tests for thousands of SNPs. To employ this strategy you choose a SNP to be tested from a catalog list of those offered. If you choose wisely, you may be able to advance your search for a modest cost. However, if you are ordering single SNP tests at random you can easily spend more, over time, than you would by starting with a more comprehensive test in the beginning. Ordering single tests in sequence is also time consuming because you really should order one at at time, wait weeks for the results and then decide whether another single SNP test would be useful. Single tests are currently $39 at FTDNA and about half that at YSEQ. Both are legitimate labs. FTDNA is in Houston, TX, and YSEQ is in Berlin, Germany. YSEQ is a nimble two person operation that specializes in yDNA. FTDNA offers more comprehensive DNA testing products and services including easy integration into thousands of volunteer led projects. Your needs may better by hanging on to the money you have available now and waiting until you can afford a more comprehensive test. While the single SNP testing above is somewhat like dispatching a census taker to a specific location to see in a given SNP is negative or positive, the more comprehensive testing is more similar to taking satellite photographs of the 58 million or so SNPs along your Y chromosome. Many passes are made and stitched together by a computer algorithm. While it may not be as exact in every case as the individually targeted SNP testing (Sanger), it is certainly more cost effective and gives results for locations which at present have no single SNP test yet available. At this writing the listed price for BIG Y is $575 and Y Elite 2.0 is $775. The latter is more comprehensive although both will give most genetic genealogists more data than they can process. FTDNA will not sell such advanced tests to anyone who does not yet have STR test results or Geno 2.0 results. Full Genomes has no such entry requirement. These comprehensive tests have the added advantage of yielding not only a haplogroup designation but providing a list of unique SNPs that may be approaching offering a terminal SNP that could serve the same family identifying function that did the coats of arms of old. The newest commercial offerings to ySNP chasers are a wide variety of "panels". These are bundles that offer many tests of individual SNPs in one or two steps to narrow in on a specific haplogroup. These are offered by both YSEQ and FTDNA and generally are priced about $88 to $120. While these can screen many SNPs at one time, they generally only identify only one or two SNPs along your migratory path. Buyers should beware that such offerings actually have potential benefit for them. Please order SNPs with the help of an expert, if you aren’t sure which SNP(s) will benefit your research. Before ordering, you should ask the advice of an expert on your haplogroup and subclade. We recommend joining an appropiate [sic.] Y-DNA Haplogroup group project. You may then consult the administrators. Happy SNPing, but let the buyer beware! You have tested 67 ySTR (short tandem repeats) markers and you still want to learn more. What's a guy to do? If you have several closely bunched matches at that level, you may want to upgrade your test to 111 markers to see if that will sort your matches out a bit. On the other hand you may be ready to start exploring your SNP (single nucleotide polymorphic) trail down from prehistory to you. 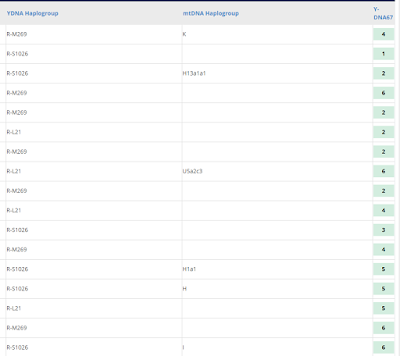 If you have tested at FTDNA, you already have been given an estimate of your haplogroup (ancient clan). One way to look at your haplogroup is as an exit number along the great SNP inter-eon freeway down which your genome has been traveling for thousands of generations. In this case your ancestor had a permanent change (SNP) in his genetic migration at exit R-M269. Since that point all of his male descendants have continued to carry that same SNP to document their journey down to you. However, this SNP is probably carried by millions of men living today. If you want to document your migration path more precisely, you will have to become a SNP chaser. If you are a novice ySNP chaser, you will have to reorient your thinking a bit. When you read the results of a 37 marker, 67 marker or 111 marker test, you are used to seeing the number of STRs that occur at given locations along your genome. Generally these are numbers like 10 or 28. These results were used by the lab to group you with other men who have identical results on most of the markers tested. It takes identical results at a group of locations (e.g. 37 or 67) considered simultaneously to identify men who may be closely related in genealogical times. Generally the more exact ySTR matches two men share, the closer they are to their common paternal ancestor. The process is somewhat like a census conducted by going to 37 or 67 houses (predefined genetic locations) and counting number of ySTRs that reside there. It is a census of STRs that live there currently. With ySNPs we are documenting a journey that is recorded in a diary of all the branching points that have occurred in the past. It is like driving from coast to coast and listing in sequential order each of the interstate exits you took. In the example above the most recent branching point the lab was able to estimate was exit (SNP) R-M269 which first showed up in the genomes of that man's ancestors many thousands of years ago. Click on "Advance Matches" shown in the illustration above. A results page similar to the one shown below will appear. This page has been truncated for privacy of the men reported. In all likelihood the SNP trails of all of these men have been identical down to the last few millennia, they show a wide variety of results in the "YDNA Haplogroup" column on the left. These differences reflect the depths of testing these men have gone through. Some of them have had no specific SNP testing at all and are predicted to be M269. Others had had some level of SNP testing completed and have been advanced to exit R-L21 -- the most common male haplogroup along the Atlantic coast of Europe. Some have taken the BIG Y test and been assigned the more precise haplogroup R-S1026. In this example it is highly likely that all of these men belong to this later classification but only testing would verify that conclusion. The relatively close 67 ySTR results (right column above) allow me to make that prediction. At present SNP chasing is really in its infancy. A vast majority of the SNPs we know today have been discovered in the last two years. We are still working to find the exact location and sequence for many of them. In some ways our knowledge today would be like getting a SNP passport with several dozen stamps on it but in random order. We know that our genomes passed through all those points but are still trying to decipher in what sequence that journey occurred. As more men are tested and we can document where they exited the main SNP trail, we can refine our chronology for all of us. 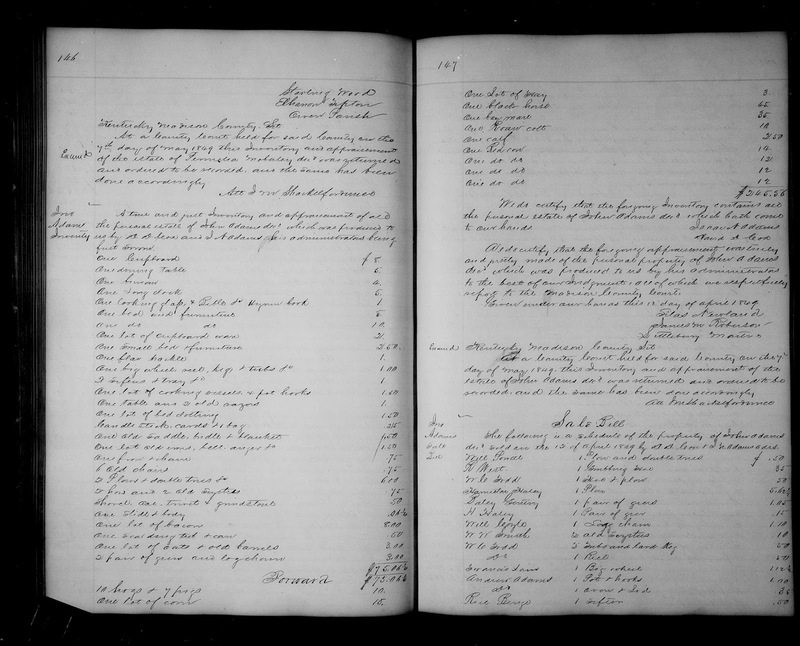 The above exercise should give some sense of direction for further SNP chasing research to trace the path of your ancestors down into the genealogical age. 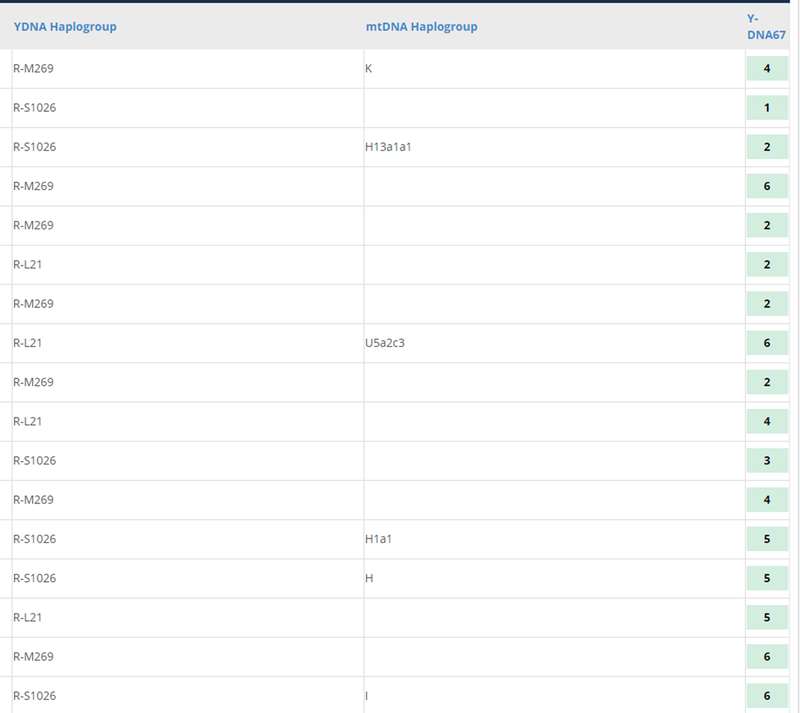 At present R-S1026 is the most recent checkpoint FTDNA has added to its published SNP Tree. Most estimates are that R-S1026 has been around for about 3,500 years. The each of the men in the above chart who have confirmed their R-S1026 status through BIG Y testing now have three dozen or so SNPs more recent than R-S1026 stamped on their passports. Some of those SNPs are shared with others and a few of them are unique. In my next post I will discuss three separate testing strategies for exploring your SNP trail. Some gifts just keep giving. 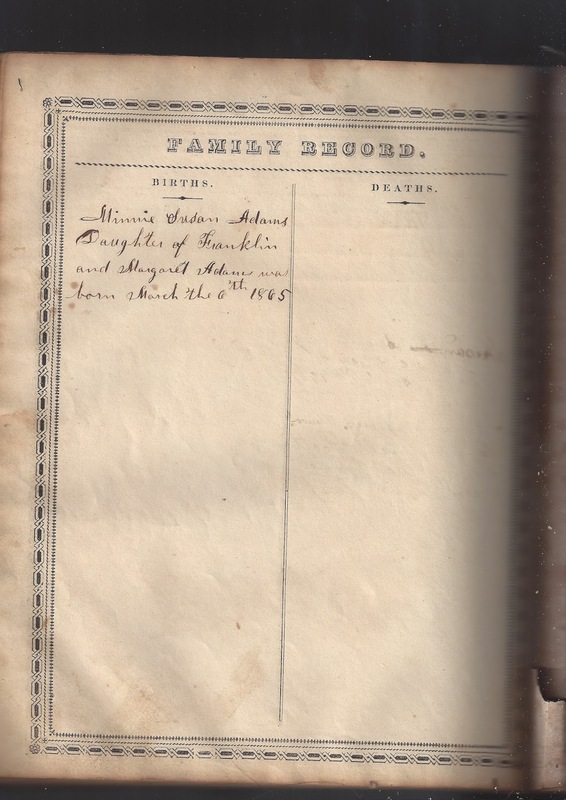 My Family Finder match, the one from page 51 of my match list, Family Finder finds Family Bible, has really started something. As he has shown me the way to breaking through my brick wall, I have been simultaneously exhilarated and humbled by the responses of readers on Facebook. I think my colleague from across the Atlantic, Brian Swann, hit the right note to describe my feelings when he commented, "Napoleon said the quality he prized above all in his generals was to be lucky." 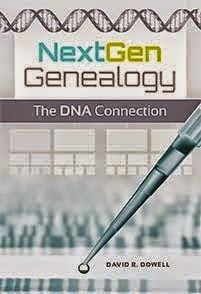 My connection with my genealogical benefactor is extremely fortuitous and also illustrates the fickleness of atDNA matches. Two of my first cousins have more significant matches with my benefactor than do I. However, for a variety of reasons which I will try to analyze later, he contacted me. 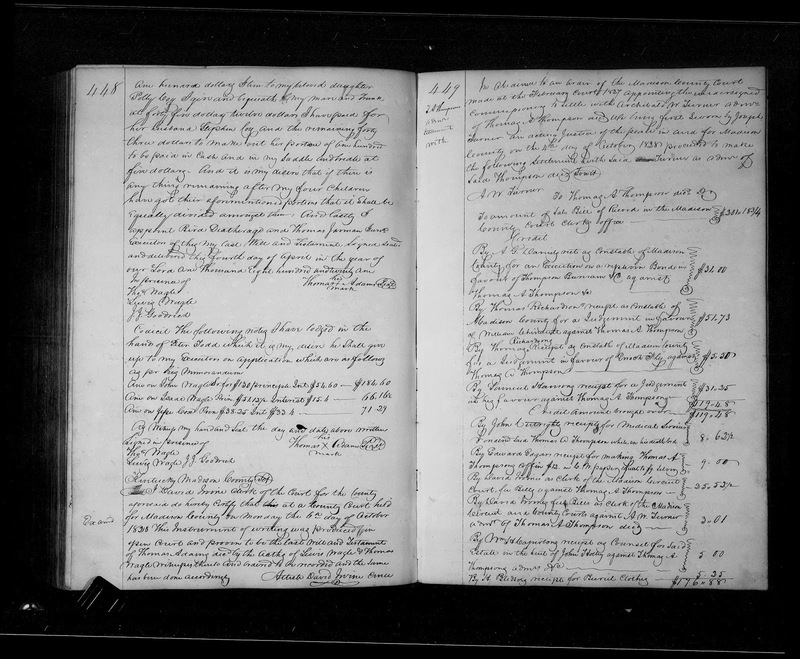 Not only did he send me scans from the family Bible of my 2nd great-grandfather, he told me where my 3rd great-grandparents were buried. 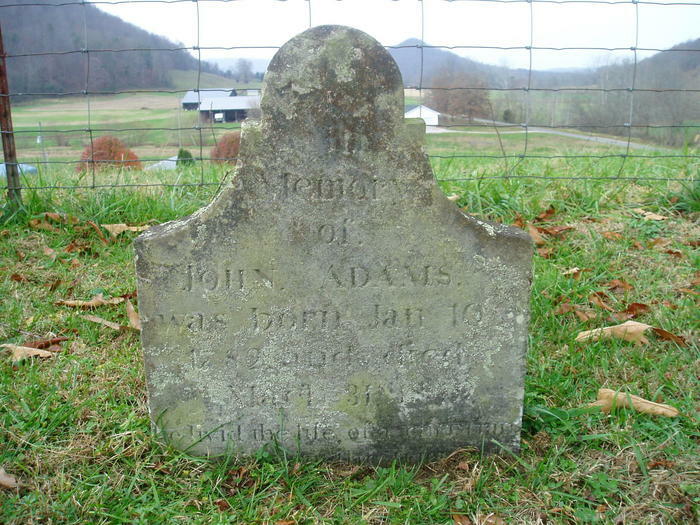 FindaGrave provided tombstone images for John, Susannah and Thomas Adams. 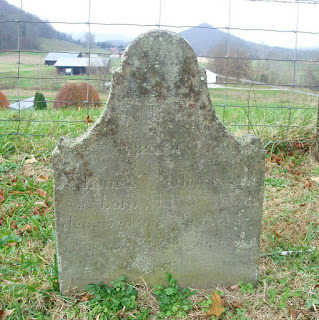 Based on the almost identical background in each of those images and the similarity of the style of the stones, one easily could be led to assume that Thomas had a close relationship with John and Susannah even though it appears that he was more than four decades older than John. 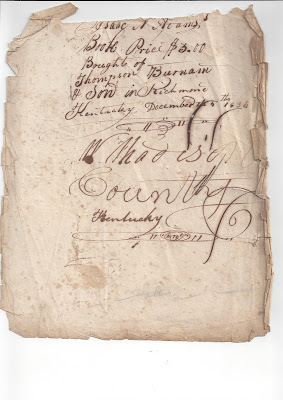 I sent a link to my recent blog post yesterday to my newly discovered third cousin -- once removed. Almost immediately I received a return email with more goodies attached. 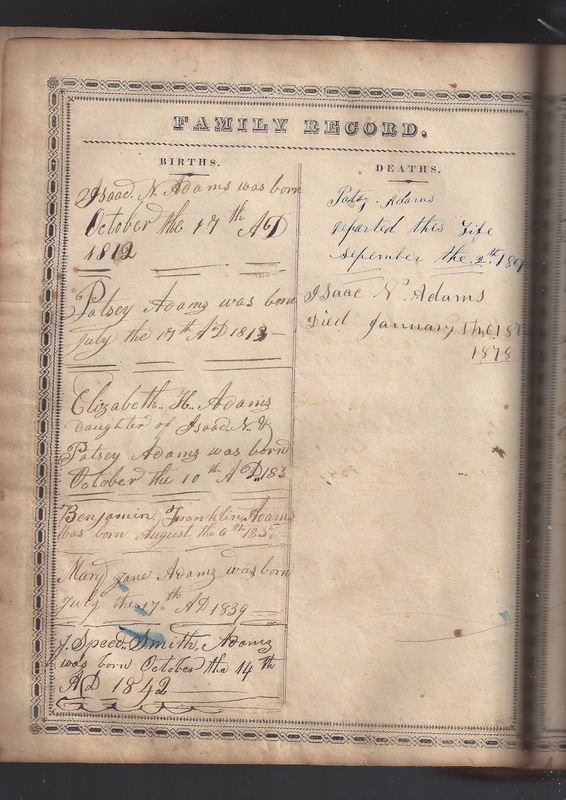 These documents seem to solidify relationships of Thomas as the patriarch of this Adams family in Madison County, John as his son and Isaac as his grandson. 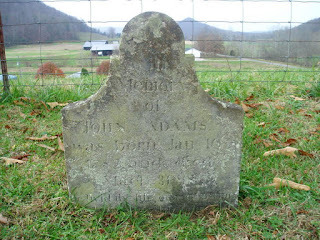 Previous to last month Isaac was my earliest known Adams ancestor. Inventory of estate of John Adams conducted by Isaac Adams. 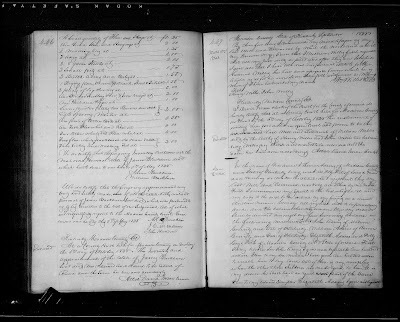 Will of Thomas Adams (page 1) which lists 4 children including John. Thank you Family Finder even if you did bury our match information 51 pages into the results. And thank you cousin for finding it anyway. Also, thanks to you and your mom for collecting and preserving these treasures. 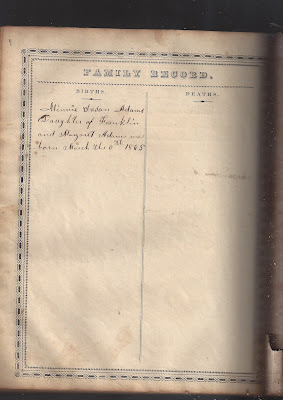 Between the information "chiseled in stone" and that is in these estate papers, I can go back even one more generation than was recorded in the family Bible. Last month I had a totally serendipitous great find that got me past one of my priority brick walls. Wish I could tell you about the clever search strategy I employed to pull this one off. However, it just fell into my lap. My greatest contribution was placing my lap in a very fortuitous location -- on the Family Finder results page at FTDNA. In retrospect that placement did not appear to be very carefully planned. It was on page 51 of my list of matches there -- not a place some of us eagerly scrutinize every day. 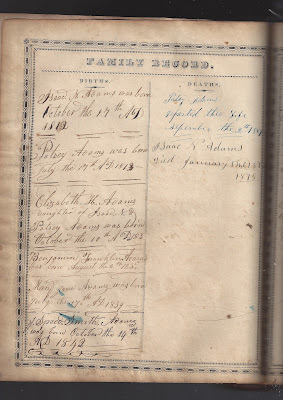 I noticed in my family finder “matches” that we share common the ancestors Isaac & Patsy Adams. If I have figured this right, that would make us 3rd cousins once removed. I have the Isaac Newton Adams family bible in my possession. It has birth dates for the children. If you wish I can make you a scan of those pages. 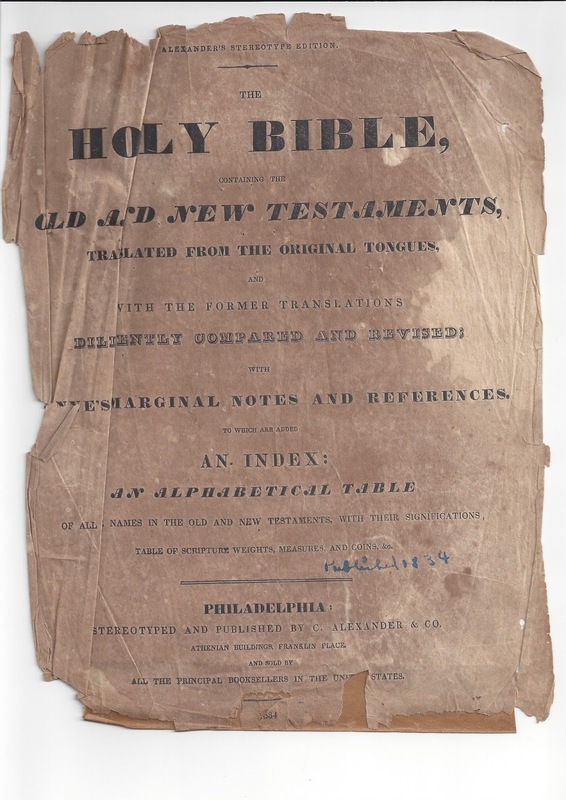 This Bible was copyrighted in 1834. 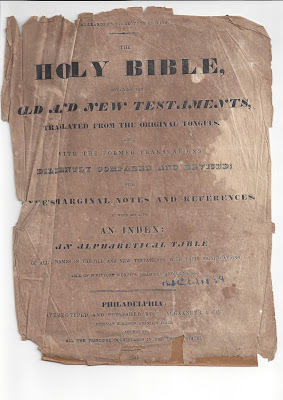 According to the above information this Bible was purchased by Isaac Adams in Richmond, KY within a few days of his marriage to Patsy in December, 1834. Birth dates for Isaac, Patsey and their children. Death dates for Isaac and Patsey. Parents names for Isaac & Patsey. Based on the Bible information I was able to find tombstone images for Isaac's parents John and Susannah (PLOWMAN) ADAMS in the Red Lick Cemetery near Duluth, Kentucky in the southeastern corner of Madison County. 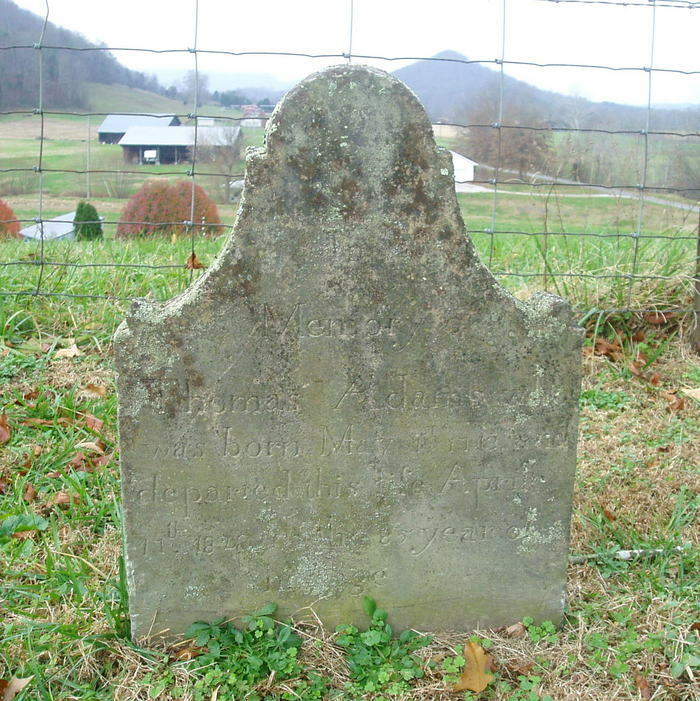 In the marriage records for Madison County for 1808, "Consent: William Williams, Guardian of the Bride" suggests that Susannah's father was probably dead before her marriage to John. Guardianship records are now high on my priority list. 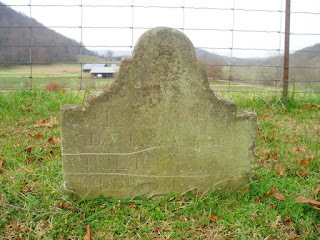 DNA did not directly give me the identity of my 3rd great-grandparents. However, it did lead the person to me who had the Bible that had that information. Our match only totaled 32 cMs and the longest segment was 10.5 cMs. However, I'll gladly take it. Thank you Family Finder and a diligent 3rd cousin - once removed who connected the dots for me!